Once the drywall, carpeting and finish trim are in place, you can't see the framing that goes into the construction of a main or second story floor. Standard floor thickness, however, is substantial, in order to provide the strength necessary for bearing the weight of the walls, the ceiling and the roof. If you're figuring the total height of a house, the thickness of the floor will depend mostly on the size of the joists. Joist dimension determines floor thickness. The floor joists comprise the bulk of the floor thickness. 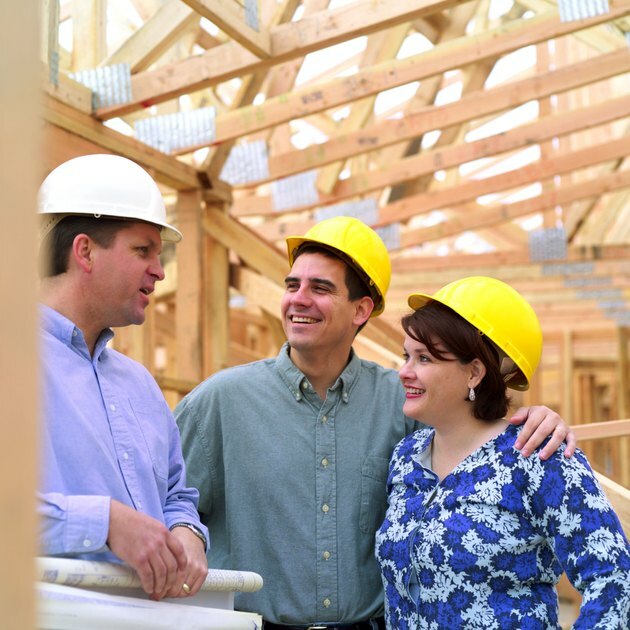 Standard floor joists are usually 2-by-10 or 2-by-12 dimensional boards, installed on edge. The actual width of those boards, however, isn't identical to what their name implies. A 2-by-10 joist is really only 9 1/4 inches wide and a 2-by-12 is only 11 1/4 inches wide, so depending upon which size joist the blueprints call for, they will add the respective measurement to the thickness of the floor. Subflooring only adds 3/4 inch to the floor thickness. There are two main types of subflooring, plywood and oriented strand board, or OSB. Both come in 4-by-8 sheets and feature tongue-and-groove installation. Construction adhesive is used between the joists and the subfloor but it does not measurably add to the thickness of the floor. The type of flooring you choose will add some height to the floor. Hardwood floors and standard carpet with pad add about 3/4 inch to the floor height. Vinyl flooring is usually the thinnest choice for floors, and 1/8-inch vinyl installed over 1/4-inch underlayment will add only 3/8 inch to the floor height. Standard drywall, installed on the ceiling below the floor, adds a minimum of 1/2 inch to the floor thickness. There are thinner types of drywall, but they are not adequate for ceiling installation. In some cases, such as a "party" ceiling, which separates individual apartment units, building code may require double drywall layers to reduce fire spread and to damper noise between floors. When accounting for joist width, subflooring, flooring and standard ceiling drywall, a floor framed with 2-by-10s will be very close to 11 1/4 inches thick. The same floor, if framed with 2-by-12s, will be 13 1/4 inches thick.